For the past eight years on a Sunday morning in February, thousands of people have gathered at Miramar Regional Park, united by one common cause - to support Joe DiMaggio Children's Hospital at its annual Tour de Broward event. Now in its ninth year, the need is greater than ever to raise funds for South Broward's only pediatric hospital, which has become the leading children's hospital in Broward and Palm Beach Counties. In Fiscal Year 2016, JDCH cared for children needing 61,607 hospital outpatient visits, 7,455 pediatric surgeries, and 9,538 admissions and observation stays. Funds from previous years have supported the hospital's Heart Institute, which provides children with a complete continuum of care from diagnosis to repair of congenital defects and other cardiac dysfunctions. It houses the Pediatric Heart Transplant Program, one of only two of its kind in South Florida. Funds have also supported programs for the Center for Cancer and Blood Disorders, helping to improve the lives of many oncology patients and families. However, the need is greater this year because funds raised will help support programs throughout Joe DiMaggio Children's Hospital, as it aims to grow in the community and continue to expand services. 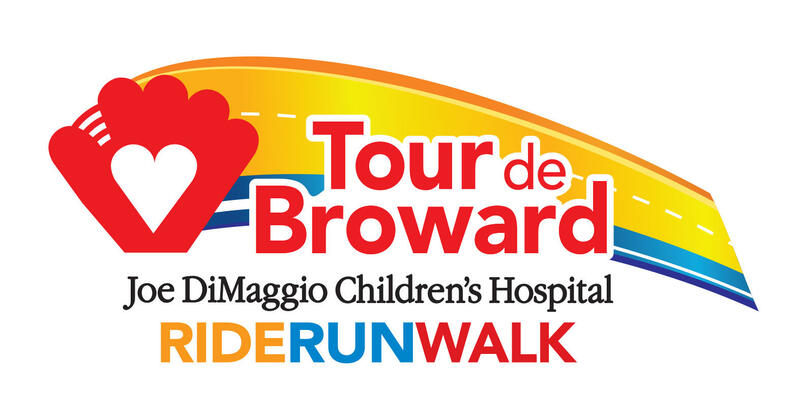 Tour de Broward 2018 will feature a variety of events for adults, kids, physically challenged athletes and wounded warriors alike. These events include a 3K Walk & 5K Timed Run; Cycling challenges - 50K and 100K; The Power of Play Kids Zone. Registration fees range from $15 to $40, depending upon the event and the day you sign up. Same-day registration is available. All registrations include Breakfast, Lunch, Event Shirt and Goodie Bag. 100K Ride, 50K Ride and 5K Run participants will receive a finisher medal. Everything is provided on a first come, first served basis. Volunteers are needed to help set up, provide customer service, and tear down after the event. If you would like to support Joe DiMaggio Children's Hospital, but can't attend on February 25, 2018, don't worry - you can sign up as a virtual participant (Under Run and Walk Registrations) at the low registration fee of just $19.92.